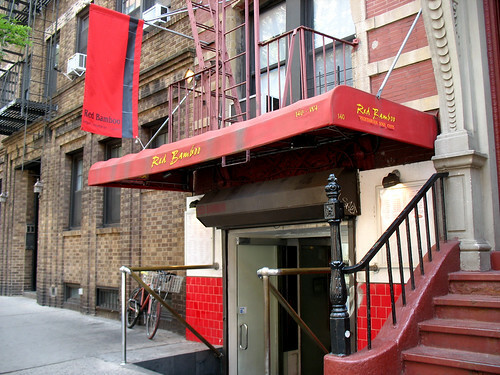 I love Red Bamboo – but it didn’t even occur to me to review their veggie burger (honestly, they have so much stuff on their menu I didn’t even realize they had one) until I was nearby one afternoon and wanted to grab a bite to eat before seeing Werner Herzog’s Cave of Forgotten Dreams at the IFC Center. I’ve eaten quite a few of the numerous vegan and vegetarian dishes from Red Bamboo’s menu over the years – my favorite is the almond coconut chicken appetizer. In fact, this may have been my first trip to the restaurant where I did not order that delicious dish (if I had been hungrier, I would have!) They also have vegetarian versions of things like steak and shrimp that I didn’t even eat before I became a vegetarian, and I will admit I am still scared to try even the faux-meat versions of these things. Their veggie burger is called the “Bamburger” – the menu notes that the soy protein in the patty contains whey, although the mayo the burger is served with is vegan… are there some vegans who don’t mind eating whey? I was a bit confused by this. Adding vegan cheese is an option as well, so it sounds like the burger could be ordered completely vegan, except for that little note about the whey... Strange. 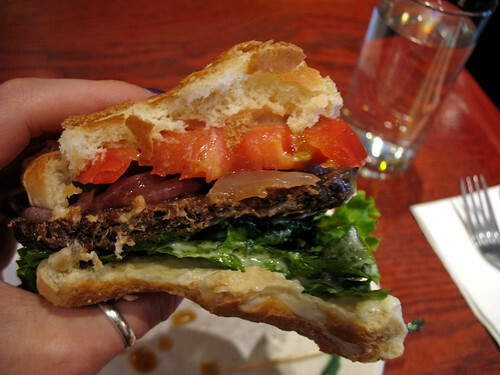 The patty consisted of very dark-colored faux meat. It was thin and rather tough, I had to really tear into it with my teeth to take a bite, it was so dense and chewy. Not what I normally expect from a burger, but it was much tastier than most faux meat products – something I’ve noticed about nearly all of the dishes I've tried at Red Bamboo, which is why I keep going back to the restaurant even though normally I am not a huge fan of faux meat. 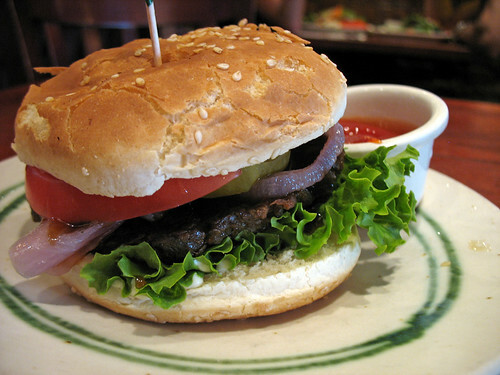 The whole burger was very drippy, perhaps because of the sauce/marinade on the patty? It was quite flavorful, kind of sweet and sour – I liked it, but it made eating very messy. Eating was further complicated by the bun, which was pretty average, studded with sesame seeds – but far too squishy and crumbley, and it fell apart in my hands. It wasn’t nearly strong enough to support its contents. The toppings themselves were pretty good – vegan mayo, pickles, carmelized onions, tomato, lettuce, and a serving of ketchup on the side which I didn’t touch because I personally feel that ketchup overwhelms the other flavors of a good burger, most of the time. A tasty burger, overall – although I have to say it didn’t blow my mind the way some of the other dishes at Red Bamboo have. I will definitely stick to my favorite almond coconut chicken next time I come back! And a side note – has anyone else noticed a surprising number of rather attractive men eating lunch or dinner by themselves, often reading a book, at Red Bamboo? Or is it just me? I would blame its proximity to NYU, except the one time I actually got up the courage to speak to one of these attractive men, he was not a student, but was visiting from out of town. 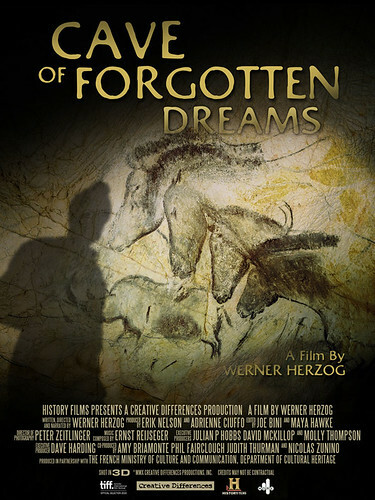 Oh, and Cave of Forgotten Dreams was outstanding. You should really go see it in the theater in all it’s 3D glory, if you can! Totally weird that the burger accessories are all vegan, but not the burger. I think I'd order that vegetarian steak instead. I love that fake meat stuff! My hubby loves all that stuff!! I am GF now so I kind of prefer raw but he adores those places like Red Bamboo! Haha, nice note about the clientele. I've never actually eaten here but I used to work pretty close by and would pick stuff up for my boss sometimes. I'm pretty sure most vegans purposely steer clear of whey; I know I do. Maybe it's an allergy thing rather than a vegan thing? Anyway, that is pretty bizarre. I find Red Bamboo uses too much faux meat. WOuld like the veggie burger to be made out of real veggies. They probably just source their patties from a factory-produced line.